Raven’s Flight presents . 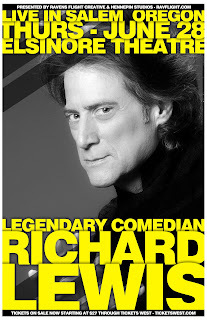 . .
One of the Godfather's of modern comedy, the legendary RICHARD LEWIS, will be performing for the first time in Oregon; first in Salem on Thursday June 28th at the Historic Elsinore Theatre and then in Eugene on Friday June 29th at the McDonald Theatre. Lewis has taken his lifelong therapy fodder and carved it into a commanding, compelling art form. His early career as a stand-up brought him to the top of his ranks. Over time and through a variety of mediums, he broadened his exposure and more and more came on board to appreciate his brilliantly warped world. Comedy Central has recognized Mr. Lewis as one of the top 50 stand-up comedians of all time, and he was charted on GQ Magazine’s list of the ’20th Century’s Most Influential Humorists’. In December of 1989, Lewis achieved a very personal goal… He performed at Carnegie Hall to a standing room only audience. Though LEWIS has appeared in a number of films (Robin Hood: Men In Tights) and TV Shows (Curb Your Enthusiasm), he is best known as being a “Comedian’s comedian,” taking stand-up to a level of artistry. Which is to say, he is hilarious. Recently, Lewis has begun sharing a more personal element to his comedy; in his words “spilling his guts” on stage. His intimate, straightforward comedy has made him a legend. We are thrilled to host Richard Lewis and look forward to a killer show of comedy. Don’t miss this chance to see one of comedy’s living legends in action!